Gas combi boilers: servicing checks and common problems - Which? What checks should you expect during a boiler service? Getting your boiler checked annually by a Gas Safe Register-accredited engineer will keep it running smoothly and prevent problems or costly repair bills in the future. We spoke to Ché Richard from Hampstead and Highgate Heating & Plumbing Company, who told us: ‘A happy home starts with heating and hot water on demand.’ While that’s not the traditional quote, he’s got a point. There will always be some faults, such as pump failure, than can happen at any time and are impossible to foresee during a service. But an annual service will pick up most common problems, as well as carrying out potentially life-saving tests on emissions and air pressure. If you need to find a reputable heating engineer to service your boiler, Which? Trusted Traders can help. 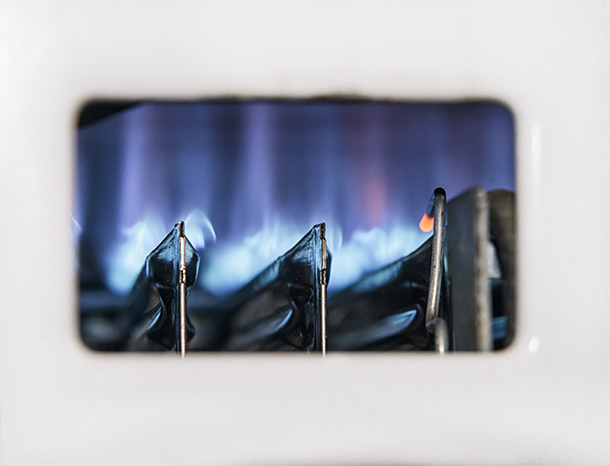 Read on for information about common problems with gas-combination boilers, and checks you should expect during a service. All the prices below are estimates and will vary depending on the age and condition of your heating system, and your geographic area. If this is the first time a heating engineer checks your boiler, this is a good baseline test to see how well your system is working. A fault in this one area affects the performance of the whole boiler. If your trader is familiar with your boiler and heating system, they may not need to do this test every year. If the expansion vessel is working properly, the water in your boiler has space to expand when it gets hot. Your heating engineer will need to have what looks like a bicycle pump or a foot pump to ‘charge’ the expansion vessel, so that it has the right amount of air pressure inside it. Without first isolating and draining the boiler, you can’t tell whether the expansion vessel is working properly, even if readings and combustion analyses all fall within the normal parameters. Over time, the air in the expansion vessel can dissipate, leaving the empty chamber full of water. This leaves no room for water to expand in the boiler, but the pressure gauge will not show this. Instead, as the water expands, the boiler’s gauge goes up into the red and the pressure-relief valve (a safety feature) then releases the extra water. This means the boiler appears to lose pressure continually, and you can get into a cycle of having to keep increasing it. Repeated re-pressurisation causes problems, as water coming into the system is more aerated than that already within the system, and you lose the chemical that protects the system from the inside. Over time, this leads to a build-up of rust within the pipes. Solution: Once you have established whether the expansion vessel is working properly,your engineer should pump up the expansion vessel if the pressure is low. This is a compulsory test to make sure the air/gas ratio is safe. Registered Gas Safe heating engineers will have testing equipment to measure the level of carbon monoxide and other emissions coming from the boiler. Problems could be caused by the boiler’s age, or on a new boiler the gas supply could be inadequate. If your heating engineer gets an ‘at risk’ reading, they’ll turn the boiler off and look to repair it. If the reading is ‘immediately dangerous’, your heating engineer will have to isolate it from the gas supply. If you refuse permission, they are obliged to inform the National Grid, who will turn off the gas supply from outside the property. Solution: It’s very unusual to get adverse readings but, in the unlikely event that it does happen, the age and style of the boiler will affect the decision whether to repair or replace. Any repair is likely to be costly, and a boiler more than seven or eight years old is probably not worth repairing. A magnetic filter stops debris getting into your central-heating system. Most engineers will recommend fitting one to a new boiler. If the magnetic filter is made of brass, your heating engineer can attach a hose to the bottom of it, pressurise the system, then open it up - the force of the pressure coming out will clean the filter itself. But if it’s made of carbon or plastic, it has to be physically cleaned out. Opening up the boiler can lead to more costs and difficulties replacing seals. Solution: To supply and fit a new magnetic filter costs around £200. Your annual service will also be able to identify any of these common problems. Found and corrected early, they will significantly prolong the life of your boiler. The air vent releases air from the boiler to the outside. Dripping or a build-up of scale at the vent stops it working properly. This should be spotted during a service. Solution: Replace the vent (£120). This is most common in hard-water areas. If the boiler hasn’t been fitted with a magnetic filter, scale deposit build-ups can lead to blockages and cause fluctuations in temperature of hot water taps. Solution: Fit a scale reducer. Ideally this should happen when a new boiler is installed (£60 to £80). NB Another possible cause of temperature fluctuations is grit being flushed through following utility-company works on mains water pipes. One clear sign of this is iron flecks in your system – they come from the mains pipes. Take note if your local water company is working on the mains system on the road outside your home – normally it will take a week for any problems to show up. If your boiler has been affected following utility works, the utility company can be liable for any damage caused, as boiler manufacturers are unlikely to uphold your warranty in these circumstances. This may cause constant dripping from the copper pipe leading to the external wall. Often this goes all the way back to a faulty expansion vessel. If the pressure-relief valve is overused, bits of grit can get caught inside it, preventing the valve from sealing properly and making it drip. Solution: Your engineer should check the expansion vessel and replace the pressure-relief valve (£120 to £200). If the pump fails, it would leave you with no heating or hot water. Bad news at any time, particularly in winter. It is caused by sludge in the system, or old age. Solution: Replace the pump (£250). When you switch on your central heating, the boiler lets the water go round the heating system. When you turn the hot water on, it diverts it. If the motor inside the diverter valve fails, instead of diverting the water, the valve can just slide back and forwards in place, or it will stop working because of resistance. So the system can get 'stuck' on hot water or central heating. Solution: Replace the diverter valve (£240). When radiators are hot at the top with cold spots at the bottom, it usually means there is a build-up of sludge. This happens for a number of reasons – lack of proper servicing, poor fitting, lack of cleaning after conversion to a combi system, rust levels, air in the pipes, or the quality of water going through the system. If you have an older system dating to the 1980s or earlier, powerflushing is unlikely to help. Sludge can bake on to the pipes and become crystallised over time. Also, copper shortages in the late 70s and early 80s led to copper pipes being mixed with steel, which would be washed away by powerflushing. Solution: The system may need a powerflush, but this is costly (£330 to £450) and not always the best solution. A good heating engineer will be able to talk you through the best option for your heating system. Which? Trusted Traders has endorsed heating engineers in your area who can help.